The teams document whether passengers fidget, use a computer, have a “jump” in their Adam’s apple or a “cold penetrating stare,” among other behaviors, according to the records. A Boston Globe expose has revealed that the federal air marshals are tracking the profiles of unsuspecting U.S. citizens who aren’t involved in a crime or are on a terrorist watch list and collecting extensive details on their movements and behavior under a new domestic surveillance program. 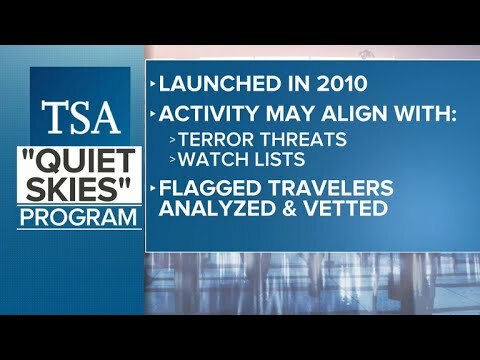 The program, called “Quiet Skies,” specifically targets travelers who “are not under investigation by any agency and are not in the Terrorist Screening Data Base,” a Transportation Security Administration, TSA bulletin stated in March. The program has tried to thwart any potential aviation threats, a TSA official confirmed to the CNN. According to Globe’s investigation, before people board a plane and are watched by federal air marshals, officials use information from the intelligence community and their previous travel patterns to help choose the target, the TSA official stated. Adding that the program has been in existence in some form since 2010 and that the Congress is aware and provides “robust” oversight. According to the government documents obtained by the Globe, thousands of passengers are spied on through surveillance in the airport and aboard flights by small teams of air marshals. The officials, according to the Globe, are on a hunt for a checklist of behaviors such as those abnormally aware of surroundings; or who are exhibiting behavioral indicators such as excessive fidgeting, excessive perspiration, rapid eye blinking, rubbing or wringing of hands; with an appearance that was different than information provided; or if the person slept during the flight, etc. The teams document whether passengers fidget, use a computer, have a “jump” in their Adam’s apple or a “cold penetrating stare,” among other behaviors, according to the records. The TSA, however, has denied that its program targets ordinary Americans. “The program absolutely isn’t intended to surveil ordinary Americans. Instead, its purpose is to ensure passengers and flight crew are protected during air travel — no different than putting a police officer on a beat where intelligence and information present the need for increased watch and deterrence. The program analyzes information on a passenger’s travel patterns while taking the whole picture into account and adds an additional line of defense to aviation security,” the agency said in a statement. Per the records, the teams have been tracking the citizens on domestic flights, to or from dozens of cities big and small — such as Boston and Harrisburg, Pa., Washington, D.C., and Myrtle Beach, S.C., even taking account of whether travelers use a phone, go to the bathroom, chat with others, or change clothes. George Washington University law professor Jonathan Turley told the Globe, Quiet Skies touches on several sensitive legal issues and appears to fall into a gray area of privacy law.